Eye surgery, also known as ocular surgery, is surgery performed on the eye or its adnexa, typically by an ophthalmologist. The eye is a very fragile organ, and requires extreme care before, during, and after a surgical procedure to minimise or prevent further damage. An expert eye surgeon is responsible for selecting the appropriate surgical procedure for the patient, and for taking the necessary safety precautions. Mentions of eye surgery can be found in several ancient texts dating back as early as 1800 BC, with cataract treatment starting in the fifth century BC. Today it continues to be a widely practiced type of surgery, having developed various techniques for treating eye problems. Since the eye is heavily supplied by nerves, anesthesia is essential. Local anesthesia is most commonly used. Topical anesthesia using lidocaine topical gel are often used for quick procedures. Since topical anesthesia requires cooperation from the patient, general anesthesia is often used for children, traumatic eye injuries, major orbitotomies and for apprehensive patients. The physician administering anesthesia, or a nurse anesthetist or anesthetist assistant with expertise in anesthesia of the eye, monitors the patient's cardiovascular status. Sterile precautions are taken to prepare the area for surgery and lower the risk of infection. These precautions include the use of antiseptics, such as povidone-iodine, and sterile drapes, gowns and gloves. Although the terms laser eye surgery and refractive surgery are commonly used as if they were interchangeable, this is not the case. Lasers may be used to treat nonrefractive conditions (e.g. to seal a retinal tear). Laser eye surgery or laser corneal surgery is a medical procedure that uses a laser to reshape the surface of the eye. This is done to correct myopia (short-sightedness), hypermetropia (long sightedness) and astigmatism (uneven curvature of the eye's surface). It is important to note that refractive surgery is not compatible with everyone, and rarely people may find that eyewear is still needed after surgery. Recent developments also include procedures that can change eye color from brown to blue. Canaloplasty is an advanced, nonpenetrating procedure designed to enhance drainage through the eye’s natural drainage system to provide sustained reduction of IOP. Canaloplasty utilizes microcatheter technology in a simple and minimally invasive procedure. To perform a canaloplasty, an ophthalmologist creates a tiny incision to gain access to a canal in the eye. A microcatheter circumnavigates the canal around the iris, enlarging the main drainage channel and its smaller collector channels through the injection of a sterile, gel-like material called viscoelastic. The catheter is then removed and a suture is placed within the canal and tightened. By opening up the canal, the pressure inside the eye can be reduced. Eye color change surgery through an iris implant, known as Brightocular, or stripping away the top layer of eye pigment, known as the Stroma procedure. Pars plana vitrectomy (PPV), or trans pars plana vitrectomy (TPPV), is a procedure to remove vitreous opacities and membranes through a pars plana incision. It is frequently combined with other intraocular procedures for the treatment of giant retinal tears, tractional retinal detachments, and posterior vitreous detachments. East Asian blepharoplasty also known as double eyelid surgery, is used to create a double eyelid crease for patients who have a single crease (monolid). A ciliectomy is (1) the surgical removal of part of the ciliary body, or (2) the surgical removal of part of a margin of an eyelid containing the roots of the eyelashes. A conjunctivoanstrostomy is an opening made from the inferior conjuctival cul-de-sac into the maxillary sinus for the treatment of epiphora. An iridectomesodialysis is the formation of an artificial pupil by detaching and excising a portion of the iris at its periphery. ^ "Ophthalmologic Surgery – procedure, recovery, blood, pain, complications, time, infection, medication". www.surgeryencyclopedia.com. ^ "The History of Ophthalmology". ^ Maguire, Stephen. "Laser Eye Surgery". The Irish Times. ^ "Laser Eye Surgery Suitability". Optical Express. ^ Lewis, Richard A.; Wolff, Kurt von; Tetz, Manfred; Koerber, Norbert; Kearney, John R.; Shingleton, Bradford J.; Samuelson, Thomas W. (1 May 2009). "Canaloplasty: Circumferential viscodilation and tensioning of Schlemm canal using a flexible microcatheter for the treatment of open-angle glaucoma in adults". Journal of Cataract & Refractive Surgery. 35 (5): 814–824. doi:10.1016/j.jcrs.2009.01.010. PMID 19393879 – via www.jcrsjournal.org. ^ a b "Laser In-Situ Keratomileusis (LASIK) – procedure, recovery, pain, complications, time, infection, medication, prep". www.surgeryencyclopedia.com. ^ "Photorefractive Keratectomy (PRK) – procedure, recovery, pain, complications, time, infection, cells, risk". www.surgeryencyclopedia.com. ^ a b "Corneal Transplantation – procedure, recovery, blood, removal, complications, adults, time, infection". www.surgeryencyclopedia.com. ^ "Indiana University Department of Ophthalmology – Phototherapeutic Keratectomy (PTK)". iupui.edu. ^ "Surgery – Eye Color Changer". eyecolorchanger.org. ^ a b "Photocoagulation Therapy – procedure, test, blood, removal, complications, adults, time, medication". www.surgeryencyclopedia.com. ^ "Scleral Buckling – procedure, recovery, removal, pain, complications, time, infection, medication". www.surgeryencyclopedia.com. ^ "Retinal Cryopexy – procedure, recovery, test, blood, pain, complications, adults, time". www.surgeryencyclopedia.com. 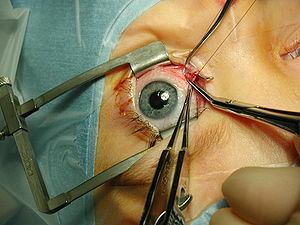 ^ "Eye Muscle Surgery – procedure, recovery, blood, pain, complications, adults, time, infection". www.surgeryencyclopedia.com. ^ "Blepharoplasty – procedure, blood, removal, pain, complications, time, infection, risk". www.surgeryencyclopedia.com. ^ "Browplasty: Background, Problem, Epidemiology". 20 June 2017 – via eMedicine. ^ "Enucleation, Eye – procedure, recovery, removal, pain, complications, time, infection, operation". www.surgeryencyclopedia.com. ^ a b c Cassin, B. and Solomon, S. Dictionary of Eye Terminology. Gainesville, Florida: Triad Publishing Company, 1990. ^ "Exenteration – procedure, recovery, blood, tube, removal, pain, complications, infection". www.surgeryencyclopedia.com.